The idea of QuizPACK is simple. A teacher provides the core content of a question: a parameterized fragment of code to be evaluated and an expression that have to be evaluated by the student at the end of the fragment execution. 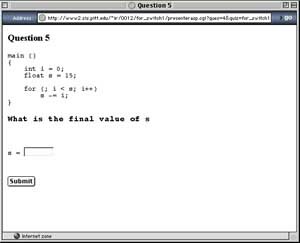 The system does the rest: randomly generates a question parameter, creates a presentation of the parameterized question in a Web-based quiz, gets the student's input, compares the student's answer with the result of running the parameterized code "behind the stage", and records the results into a server-side database. The ontology consists of 1530 triples. It contains 574 rdfs:Class's and defines 5 rdf:Property's. Create a username, using the first initial of your first name and your family name.